Have you ever hopped out of your shower just to stare straight right at another person outside of the window? Well, we haven't either, but with our bathroom sharing a window with the car port, it was only a matter of time. Something had to be done to give us some privacy. I knew I didn't want a shade or anything fabric in there since we like really hot steamy showers, and blinds look a little tacky in this bathroom. I mean you can clearly see in the picture below how easy it would be to catch someone at the wrong time and make things awkward. 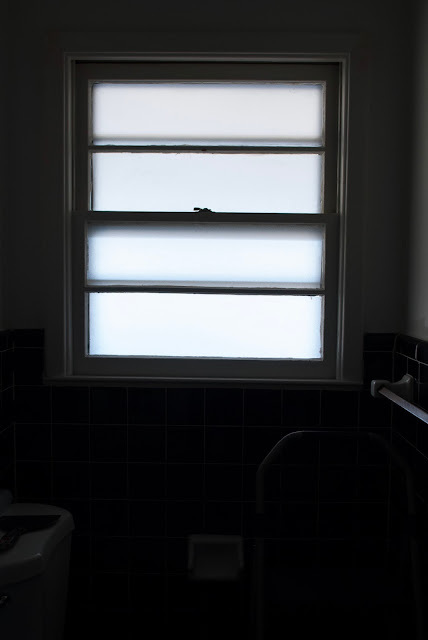 Don't get me wrong, I am so grateful that there is a window because it brings some much needed light into this dark tiled bathroom, we just had to skew the visibility. Then I came across this post from YoungHouseLove, outlining how they used frosted window film to solve their same issue. 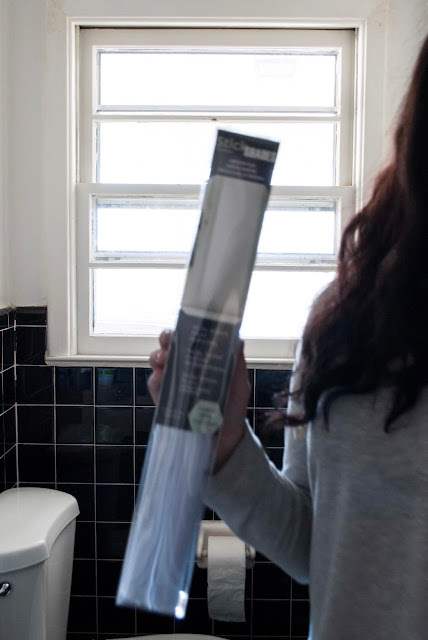 I read their post and picked up this Frosted Window Film from Wal-Mart for only $15 (sorry for the blurriness). It is literally the only thing you need for this project, except for some scissors, a knife, and a putty knife. The install steps are fairly straight forward and only took me about 40 minutes. The time would have been shorter if I had another person helping me apply the film. 1. Clean the window. This is a very important step! I had to redo the first panel I did because I didn't get all the tiny little specs of paint off and once the film was on it showed everything. So grab some good Windex. scratch that excess paint off, and get those babies looking smooth. 2. 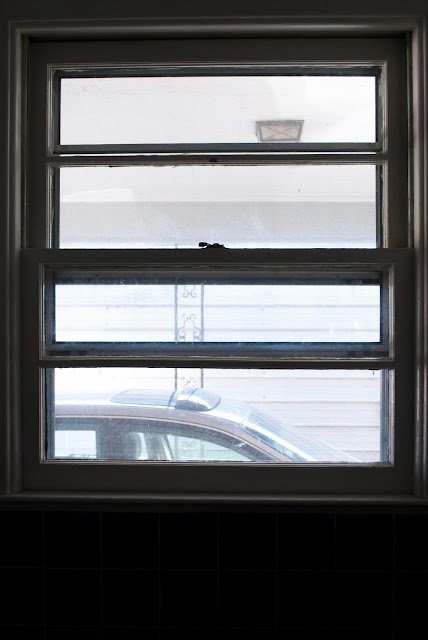 Measure the window. Pretty self-explanatory. I had 4 panes and measured/cut each one individually. 3. Cut the frosted film in the window dimensions. Since the film was rolled up into a small package, it was hard to measure and cut at the same time. I found it easiest to loosely hold up and cut the film. then lay it out and cut it in the exact dimensions. 4. Peel the backing off. Young House Love has a great tip about how to peel the backing off: put two pieces of tape on each side of the film and pull off the back. I peeled the first one off two fast and the film rolled up into the shape it had been in the packaging, a slower approach gave me a straight peel. 5. Spray window with applicator spray (in my case, water). I've read many different blogs that used spray applicator that came with the film, or some they bought, but the particular film I got from Walmart uses water and static cling. The first time I did not put enough water on and the cling slowly wore off. The packaging said to use a spray bottle for best results, and it totally worked (who would have thought it, I know). 6. Apply film. This is easiest to do with two people so that one can hold one side and the other the other side. Keeping the film pulled tight and lining up the corners is the easiest way to do this. If however you're like me and are doing this with one pair of hands, I found it the easiest to line the corners and the top line up first. 7. Smooth out bubbles with credit card (or something with a flat edge). The best way to do this is to start in the middle and work your way outwards. This gives the bubbles a shorter distance to the edges and doesn't move the film around too much. I used a medium length spackle knife. 8. Trim excess film with razor knife or exacto blade. And there you have it! A perfectly frosted window. I know when we photograph this space you guys really can't tell the difference since you're always seeing the bright light through the window. But for us it has made all the difference in giving more privacy and yet we still get all the pretty natural sun during the day. I'm no longer creeped out at getting out of the shower or getting up in the middle of the night. Here's a before and after that shows how we see it, not how it looks in the photos. 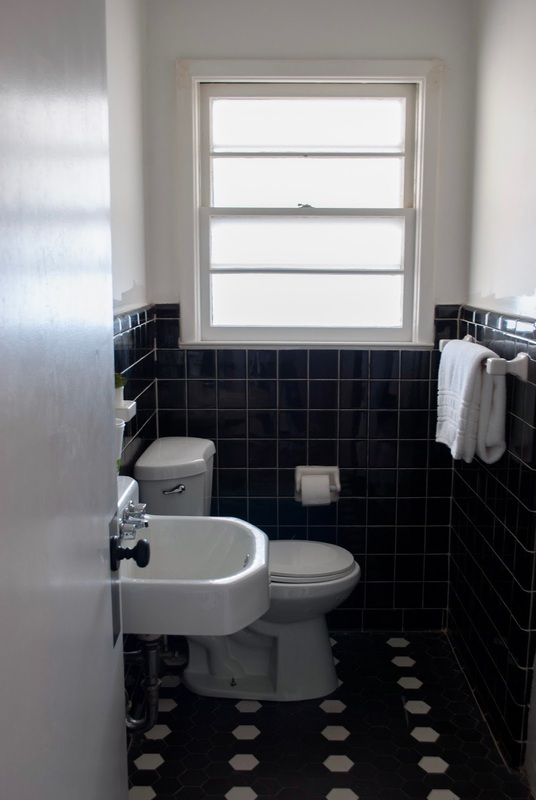 This project has shown us that even if a project is small and cheap, it can make a difference in how you feel in a space. Now its time to repaint the walls, get some decorations/storage options in there, get some new lights up, and this space will be finished off!